Cracked teeth are becoming one of the biggest problems in dentistry today and a major cause of many tooth extractions. The current generation of humans are living longer then any other previous generation. So our teeth are being asked to do a lot more for us then they have in the past. 1. Pain on chewing or when you release the biting pressure (this is because the crack is opening and closing). 2. Sensitivity to hot and cold foods or sweet things. 3. This pain or sensitivity can slowly progress to a constant toothache. If this happens, it usually means that the nerve of the tooth is now damaged. At this stage, saving the tooth becomes less likely. Many cracked teeth are caused by habits that people may not know they have. this involves people who clench or grind their teeth (see TMD section) or chew on objects such as hard sweets. The tooth is not strong enough for this constant trauma. Teeth with fillings in them are mechanically weaker, as there is less tooth structure present to hold the tooth together. The larger the filling, the weaker the tooth, and when combined with teeth grinding or chewing on hard objects, a crack is even more likely. If you suspect you have a cracked tooth, then visit your dentist as soon as possible to prevent further damage. If a crack is caught early, you increase the chance of saving the tooth or preventing more extensive and expensive treatment. A simple crack is where the nerve of the tooth is not involved. These teeth may require just a filling, or a filling and a crown. A complex crack has damaged the nerve of the tooth and may require root canal treatment before a filling and crown can be placed. 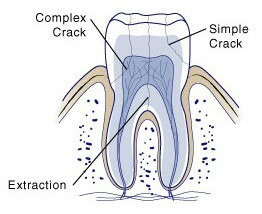 In some cases the complex crack has split the tooth. In these cases the only treatment is an extraction. When you come into FirstBite Dental, we will examine your tooth thoroughly and advise you of the appropriate treatment for your tooth.